Suitable for dry cleaners, alteration rooms and home sewers. 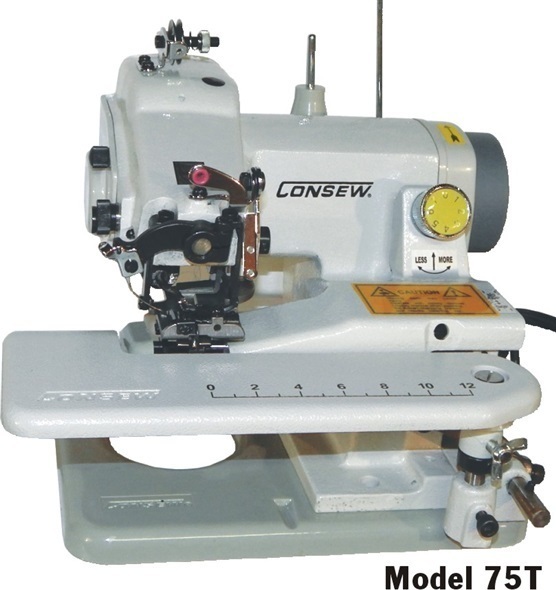 For sewing all types of light to medium-weight materials including synthetics, knits and woolens. Typical sewing operations include pant cuffs, felling slack bottoms, hemming dresses, skirt and coat bottoms, draperies, negligees, undergarments, lapel padding, blouses and sleeves. Swing-away bed plate for extended work space. Individually tested. Each 75T is individually sewn off and tested before it leaves the manufacturers facility. Just plug it in and you are ready to sew. Warranty: 90 days on labor, parts and adjustments, 1 year repair on defects in material/workmanship excluding wear and tear components.